Here you can find useful tips on training your dog, from basic obedience to tackling specific problems or just having some fun along the way. In this episode, expert trainer Gwen Bailey gets t work practising recall with Queenie. Gimme five! Follow the tips in our final Training Academy video and teach your dog to high five. Healthy treats for happy dogs. 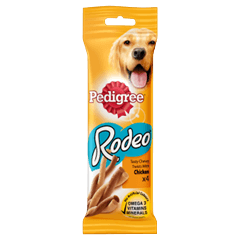 Whether it be for training, rewarding or just playing, Pedigree® Treats offer a tasty and responsible way to bond with your dog and look after their emotional wellbeing.